I must admit, these earrings are not for the faint of heart. I made them out of the 2 1/2 inch memory wire. 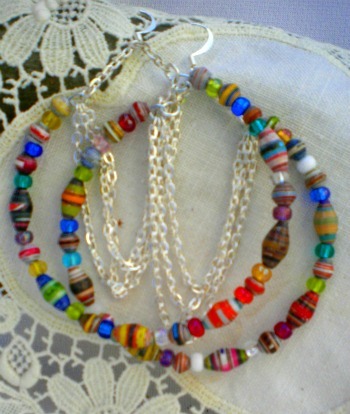 The olive shaped paper beads and small round beads are just the perfect size beads for earrings. I added fine silver chains to give it movement. I love big earrings and this is definitely one that I can wear, especially I cut my hair really short. 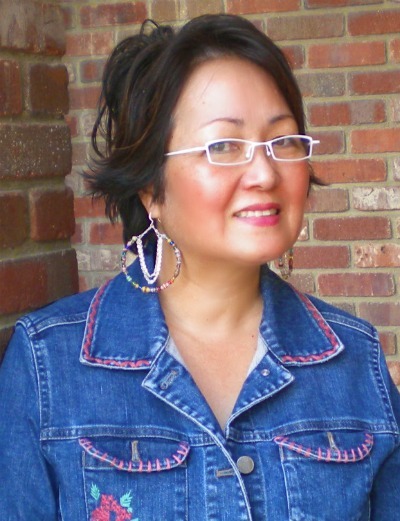 Hello Janice,Thank-You for taking time from your busy day to post this picture , i agree with everyone too and its easier to see the size of the earrings and how it compliments not only your gorgeous new haircut, but also the jacket that you are wearing…the colours do go so very well with denim too. iI agree with everyone! You look so pretty. wow…yeah …!!!! in fact, your earrings are superbe with your new haircut! thank you for adding the photo! we’ve better saw the size of these beautiful large loops …! Janice, you look so nice. 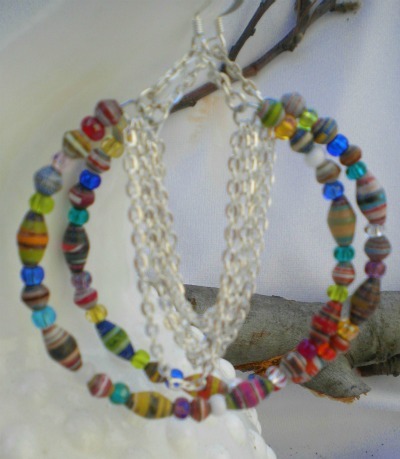 Hello there Janice,yes , i too agree with Patti and Manou,pop these lovelies in your ears and lets have a look….sometimes we are our own best models…I love the idea of the chain in these too. wow !! how big they are !!! i love these beautiful earring… so colorfull ! and i agree with patti , where are your photo ?